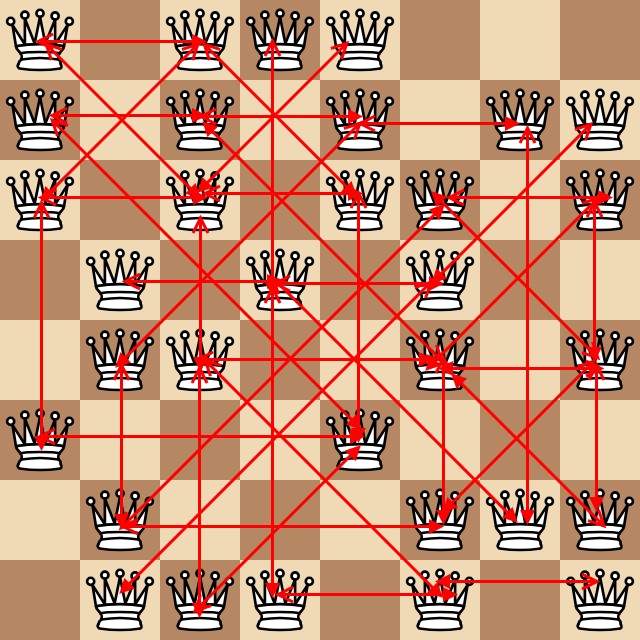 Consider the number of pairs of queens that are attacking each that are at least one square away (as a reminder, queens attack orthogonally and diagonally). In the above example, the following incredible ugly diagram shows all these pairs as arrows. Write a program that, given a board state represented by two distinct values, outputs the number of pairs of queens that attack each other with at least one square in between them. Clearly, we don't actually want vision to wrap around the board like this. So we compute how far away the edge of the board is in each direction, and view the tiles at b[i+d::d][:…]. this ray sees no queen (find returns −1). Each pair of queens is only checked once, since rays are always casted forward in reading order, from an "earlier" queen to a "later" one. Takes input as an array of 64 integers with 254 for a queen and 0 for an empty square. This version abuses arithmetic underflow to get a stop condition in the recursive part. Takes input as an array of 64 bits. We recursively call a named callback function of map() to walk through the squares in a given direction. Although we don't really need the content of the third parameter of the callback (the array map() was called upon), we indirectly use it nonetheless to know whether it is the first iteration or not. This is the x variable in the code. Input is the 0/1 format, without spaces within lines. Snails was created for a 2D pattern matching language design PPCG challenge. Most importantly, it by default outputs the number of matches found, which is perfect for this challenge. 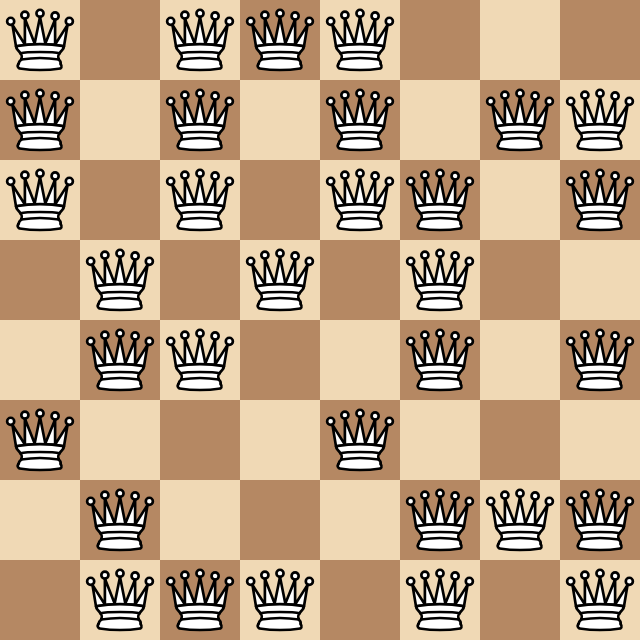 A sets the "all paths" option, so that if a queen is in multiple pairs, each of those pairs would generate a match. rdaa7 sets the match direction to S, SE, E, and NE. Setting to all directions (z) would cause double counting. \1\0+\1 matches a 1, then one or more 0s, then another 1. Create all of the substrings of the board starting at a queen. Suffix a marker value to each substring. Edit: Saved 2 bytes by leaving some garbage strings behind; these are effectively ignored. Split each marker up into an inclusive range, and add 7 to the non-zero elements. Delete every run of characters that equals the length of the marker. This is equivalent to finding each east, southwest, south or southeast ray from each queen. Count all the rays that pass through at least one empty square before meeting another queen. Takes input in the form '10111000\n10101011\n10101101\n01010100\n01100101\n10001000\n01000111\n01110101'. Turns out, SnakeEx can still be used outside of its original challenge! Not the answer you're looking for? Browse other questions tagged code-golf chess binary-matrix or ask your own question.